Sec. of State echoes claims that no Hamas ministers included in PA unity gov't; says decision doesn't mean US recognizing 'Palestine'. Secretary of State John Kerry defended Wednesday a US decision to work with the new Palestinian Authority "unity government", despite Israeli criticism, claiming that it does not include any Hamas ministers. The United States, like Israel and the European Union, consider the Islamist group Hamas a terrorist organization. Speaking to reporters in Beirut, Kerry said Palestinian Authority leader Mahmoud Abbas "made clear that this new technocratic government is committed to the principles of non violence, negotiations, recognizing the state of Israel, acceptance of the previous agreements and the Quartet principles." "Based on what we know now about the composition of this technocratic government, which has no minister affiliated to Hamas and is committed to the principles that I describe, we will work with it as we need to, as appropriate." Kerry's statement echoed comments made by Deputy State Department spokeswoman Marie Harf on Tuesday. "It is not a government backed by Hamas. There are no members of Hamas in the government," Harf told reporters. She added that the new unity government is a transitional one that is made up of individuals who are not politically associated with any party. "Hamas is a designated terror organization in the U.S. and we will not provide it with any assistance. We don't have any contacts with Hamas," declared Harf, who added that Washington would judge the government by its actions. Kerry also said US preparedness to work with the Palestinian Authority does not mean recognition of a "Palestinian state". "The US does not recognize a government with respect to Palestine because that would recognize a state and there is no state," he said. A new PA cabinet was sworn in Monday, after a surprise reconciliation deal reached in April between Hamas and the PLO. The United States, the EU, the UN and Russia have all accepted to work with the cabinet. Despite the alliance with Hamas, which does not recognize Israel and is pledged to its destruction, Abbas has said the government would abide by the principles of the Middle East Quartet, which envisage the establishment of "two states for two peoples". The US' readiness to work with the new government has prompted fury from Israel, with Prime Minister Netanyahu branding it Tuesday as "simply unacceptable". Other Israeli officials have also reacted sharply; communications Minister Gilad Erdan called the United States “naive” following Psaki’s comments and Intelligence Minister Yuval Steinitz accused Washington of hypocrisy. 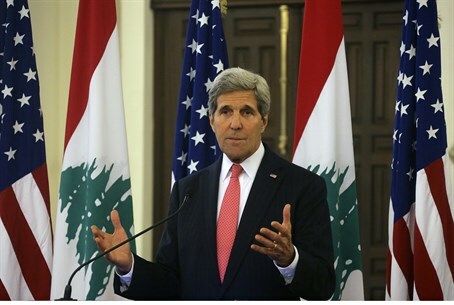 While on an unscheduled visit to Beirut, Kerry said: "I want to make it very clear we are going to be watching it (the government) very closely, as we have said from day one, to absolutely ensure that it upholds each of those things it has talked about, that it doesn't cross the line."